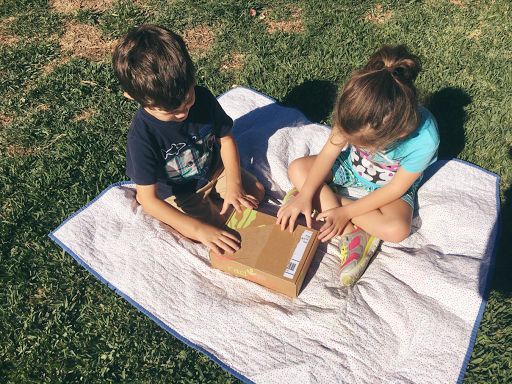 Tiny Toes in SoCal Sand: Using Raddish Kids Cooking Kit for the First Time! 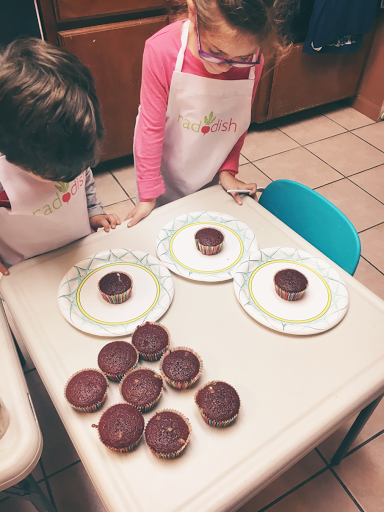 Using Raddish Kids Cooking Kit for the First Time! Two years ago at the Great Homeschool Convention I encountered a curriculum that almost took my breath away. I desperately wanted to do it, yet I knew that it just wasn't the right time. 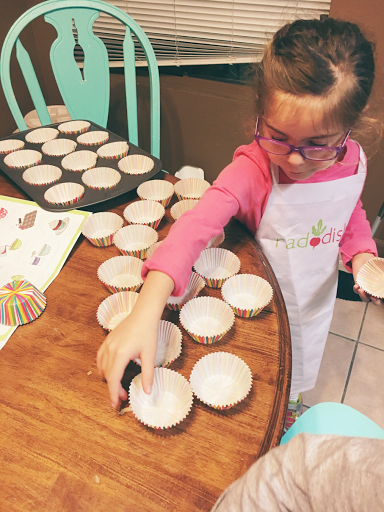 My daughter was ending her fourth year on this earth and food was such a deeply emotional topic for me that I couldn't even fathom using a curriculum with her that was based on food. Tiny B is a former micropreemie who is a smart and enthusiastic child with the sweetest personality ever seen. She had been tube-fed since the age of nine months and I had devoted my life to simultaneously tube-feeding her and trying to get her off of that tube. That tube was life-giving but it also threatened to steal my joy every single day. As the years wore on, it became painfully evident that she did not need the tube anymore and was tube-dependant. There are many children and adults who will need this giver of life forever and for them, the tube is merely a part of themselves. For Tiny B, it was causing migraines and other side-effects. I had gotten her to fifty percent oral over a few months and due to several factors, she regressed to zero food by mouth. This was approximately when I saw the Raddish Curriculum for the first time, and now you can see why it caused such a visceral reaction. Little did I know that only a month later, after nearly going out of my mind with sadness/worry/anger, I would enroll her in a tube-weaning program that would change all of our lives forever. The following year brought weight loss and fear for her but it also brought a new-found love for food. It was not an easy year by any means and she spent the year essentially learning to eat. She conquered that but still struggles with listening to hunger cues. Due to her severe growth restriction in the womb, her body is just used to not having food. We are struggling with getting her to grow and I walk the fence daily of encouraging her to eat but not causing her future issues with food. It continues to be an area of anxiety and fear within myself. 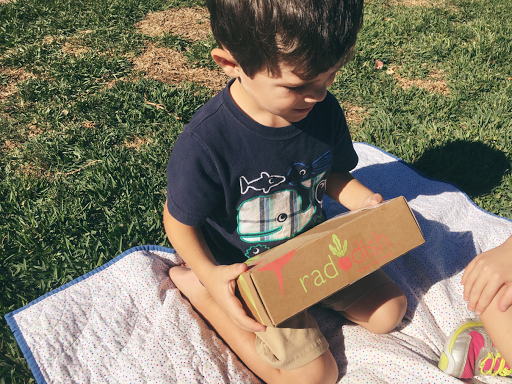 This summer at the Great Homeschool Convention I saw the Raddish booth and knew that it was time for me to try the curriculum, and so I asked if they would allow me to try it and review it. Tiny B is six years-old and Strong B is four years-old. Strong B loves learning as well and is extremely curious and kind. When they saw the box arrive they were delighted and keeping them from opening it before I was ready was quite a feat. You can see in this first picture that Strong B really couldn't contain himself and ripped it a bit before I gave him permission to open it. (Seriously, they were obsessed with this box for about a week before we dove into it). I love the enthusiasm that both of them have for learning. I am homeschooling Tiny B through a public charter school. She is in kindergarten and attends her school two days a week and I homeschool three days a week. 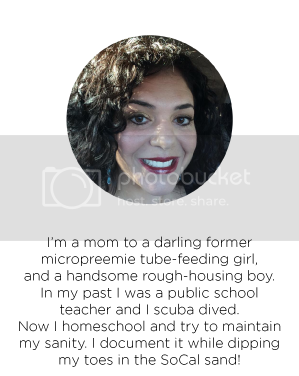 I formerly taught public elementary school for ten years and homeschooling was something that I just could not understand but has now become a calling for me. Finding curriculum that truly speaks to me and the children is absolutely crucial. When I was teaching a classroom of students, I came across curriculum that I loved and curriculum that I didn't love so much at all. The beauty of teaching my own children is that I get to choose the tools with which I'm going to teach them. 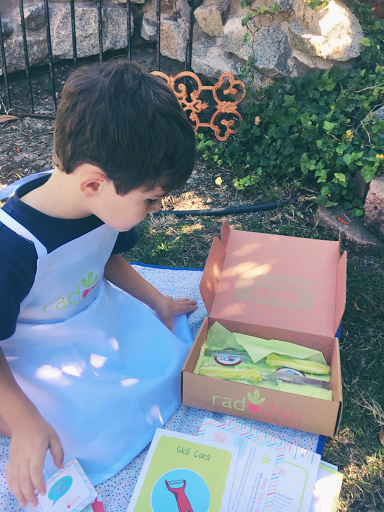 Upon opening the box, we saw the aprons with the Raddish logo and the kids wanted to wear it right away. They took out the various compontents in the box. The absolute first thing that stuck out to me was just how adorable and well made all of the cards were. 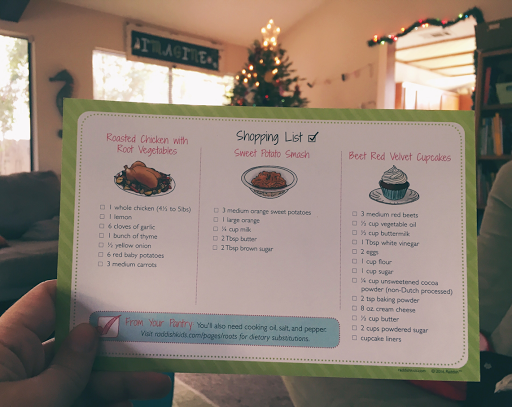 There were illustrated recipe cards and a shopping list and a tool to use in the kitchen and so much more! It was like Christmas. The graphics and shiny, well-made paper was extremely inviting to all of us. Strong B was very interested in the patch with a cupcake on it and I told him that we were going to put the patch on his apron after we completed our recipes. 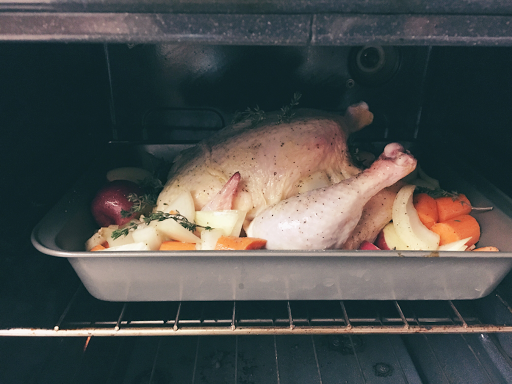 There were three main recipes which consisted of roasted chicken with root vegetables, sweet potato smash, and beet red velvet cupcakes. 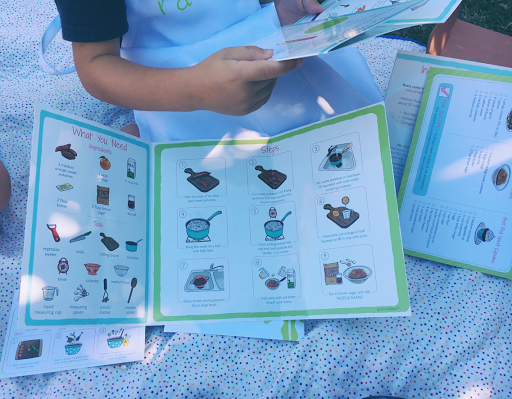 You can see the materials needed and steps of the recipes, It also had adorable illustrations which means that children using this program do not have to be readers yet. This opens it up to a much younger age group. I sat with the kids and went over our shopping list and we discussed when we wanted to make our creations and whom we wanted to cook for. All of the things involved in cooking quality recipes--the planning, the excitement, the actual food preparation, the enticing aromas during the cooking, and finally, the mouth-watering end products--all encourage a love of eating that Tiny B so desperately needs. Strong B loves to eat so this is not something that I need to actively encourage in him, but I do need to encourage the importance of prepping our own food which will always be healthier than processed options. He also needs to see that healthy food that isn't weighed down by preservatives and laden with sugar can be pure yummy-ness! We invited my parents and my granddad over to cook for them. Tiny B and Strong B were so excited during the week prior to our grand gathering. I used to be afraid that Tiny B would freak out if she knew that we ate adorable chickens and cows, but she truly doesn't care and finds it very interesting. Buying a whole raw chicken was a first for me and I must admit that I was freaked out to cook it because I'd never been daring enough before! I didn't teach myself how to cook until I was pregnant with Strong B four years ago. I've been married for almost twenty years now, so you can see that I am definitely still learning. It was something that I had always feared and now I truly love it. Anyway, sticking my hand up the chicken's cavity was quite an experience and I'm happy to say that I survived. We "read" the directions together and assembled the chicken. Our guests came over as the chicken was cooking. The smell of the chicken was quite possibly the best thing that I have smelled, ever. Knowing that we actually were cooking something capable of that smell was so much fun! I handed my mom the sweet potato recipe and they got to work with the next step of our meal. Including my mom was a purposeful move on my part. 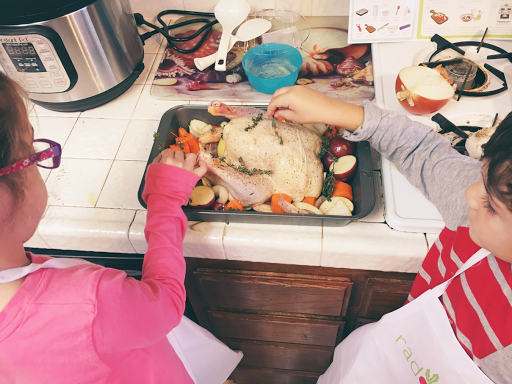 They ADORE her and I wanted the kids to see that cooking can be a communal activity. 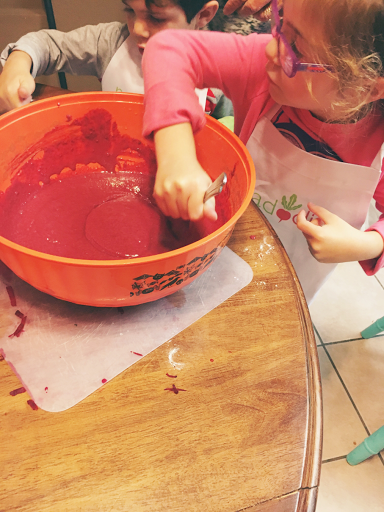 Tiny B loved mashing up those sweet potatoes and it was absolutely perfect for her fine and gross motor skills. 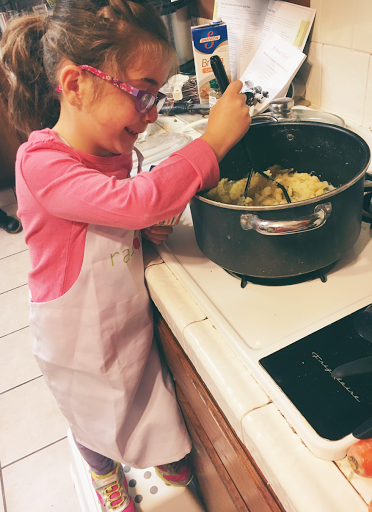 Pulling parts out of a chicken, slicing onions, sprinkling herbs, and mashing potatoes are all excellent ways to exercise the hands and coordinate the fingers, which in turn help her in her writing skills! 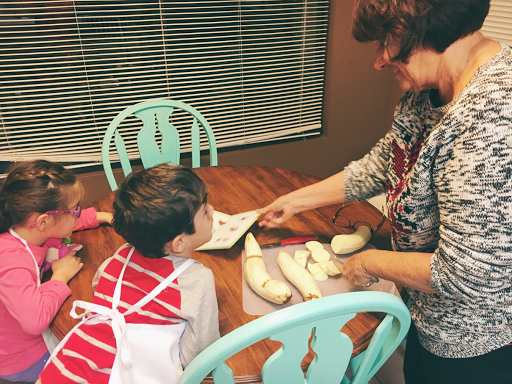 Her occupational therapists have always encouraged me to do real life activities to strengthen her hands and fingers, and it doesn't get more real life than cooking. These cupcakes were super special because one of the main ingrediants was beets. That's what produced the lovely red color, instead of food coloring. I made sure to share with them how healthy this was. Would you believe it if I told you that I actually forgot to take a picture of them using the tool that came with the kit this month? It was a thin spatula-type tool that was used to take the cupcakes out of the pan. Every month a tool is included in the kit. 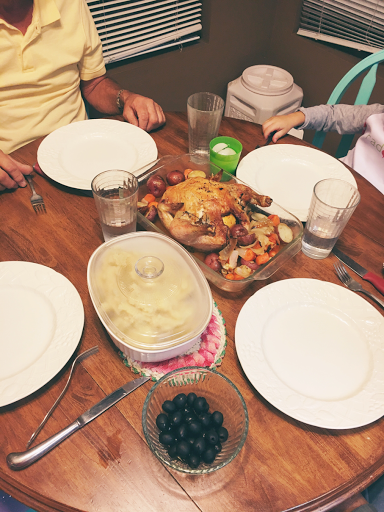 We sat down to eat and we were so proud of the food that we had lovinly created. Our kitchen isn't the prettiest and I don't know how to make perfect place settings (yet) but I can guarantee that this table was filled with love and amazing food. My dear grandad was tickled pink that they wanted him here. He doesn't look it, but I promise that he was. And the food....was AMAZING. I saved every recipe to do again and again. Just looking at pictures of the chicken makes my mouth water. 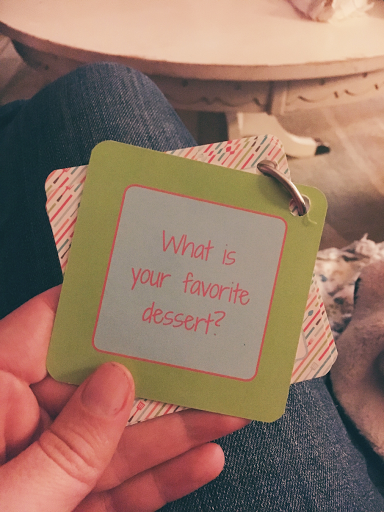 As we ate our cupcakes in the family room (luckily we can do this because our carpet is just about as fancy as our kitchen tile) we did Table Talk which is a key ring with questions attached, meant to spark conversation at the dinner table (or the family room table). 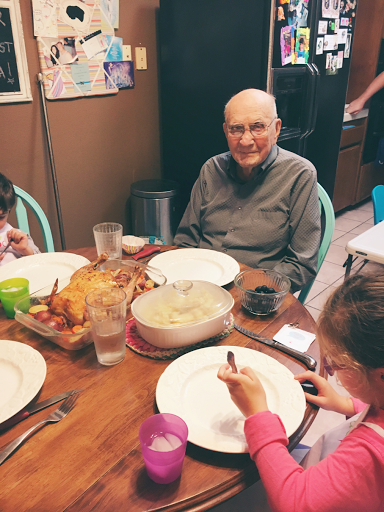 We learned that my grandad has a hard time picking out his favorite dessert because he's not much of a dessert person as well as some other fun facts about each other! A conversation involving a four year-old and a ninety year-old plus lots of ages in between is not only fun but a huge learning experience in the give and take of conversation. I can honestly say that I truly enjoyed our experience and so did the kiddos. Not only did all kinds of learning take place, but I felt that I made definite steps towards helping Tiny B towards a love of food. This is the kind of curriculum that children will remember forever. 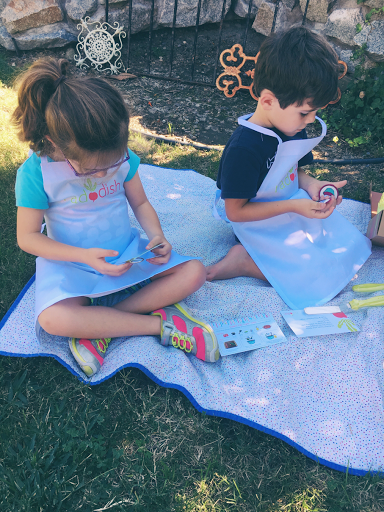 They will remember waiting for their box to arrive, opening it to see what it is they will make this month and what tools they will use, and what patch they will earn to put on their apron. I was given a free kit in exchange for a review but I promise that my opinions are one hundred percent honest.